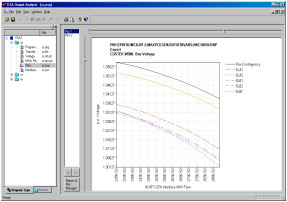 VSAT is a highly automated analysis tool designed for a comprehensive voltage security assessment using powerflow-based steady-state methods. VSAT includes flexible specification of voltage security criteria and computational features required to assess the voltage performance of power systems. Like TSAT and SSAT, VSAT can be used to calculate security limits under specified criteria, contingencies, and transfer conditions.